Rock group Radiohead have gone to number one in the album charts with their new release Hail To The Thief. The album - the band's sixth studio album - was released on Monday and outsold last week's number one, You Gotta Go There To Come Back from Stereophonics, which slipped to number two. Official sales figures for Hail To The Thief have yet to be released. Earlier in the week, however, the album was thought to be on track to become the fastest-selling album of the year so far. Record shops said it was selling so fast that it could overtake last year's fastest-selling albums by Coldplay and Robbie Williams. 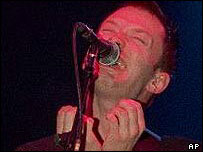 Coldplay's A Rush Of Blood To The Head sold 270,000 copies in its first week and Williams' Escapology sold 260,000 copies. HMV chart spokesman Gennaro Castaldo told music magazine NME: "It just goes to show how many people are still into Radiohead. There's a degree of compulsion with this band." The release of the album has been complemented by the launch of the band's own internet TV channel. The band also relaunched their website. It features digital animations on the themes of mass media culture and 24-hour cities. There There - the first single from Radiohead's new album - went to number four in the UK chart earlier in June. The band have just finished a string of low-key UK shows and are gearing up to play 12 European festivals - including Glastonbury - during the summer. Elsewhere in the album chart, Annie Lennox's solo album Bare entered at number three. Metallica's first long player in six years, St Anger, dropped to number three in its second week. The singles chart saw little-known rock group Evanescence hold on to the top spot for the second week with Bring Me To Life. R&B singer R Kelly remained at number two with Ignition Remix. The highest new entry was Christina Aguilera's Fighter, followed by Dannii Minogue's Don't Wanna Lose This Feeling, which came in at number five. Jennifer Lopez, however, just missed making the top 10, entering the singles chart at number 11 with I'm Glad.